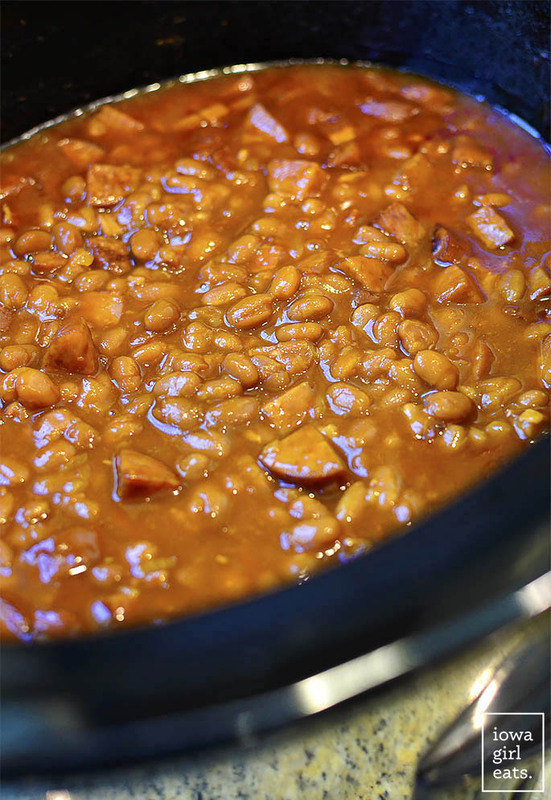 Crock Pot Baked Beans is a rich, sassy, and simple crock pot recipe that’s sure to become a summertime side dish staple at your house! 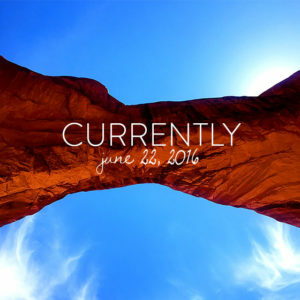 Hello, hello – welcome to a new week – I hope you had a nice, productive weekend! ? 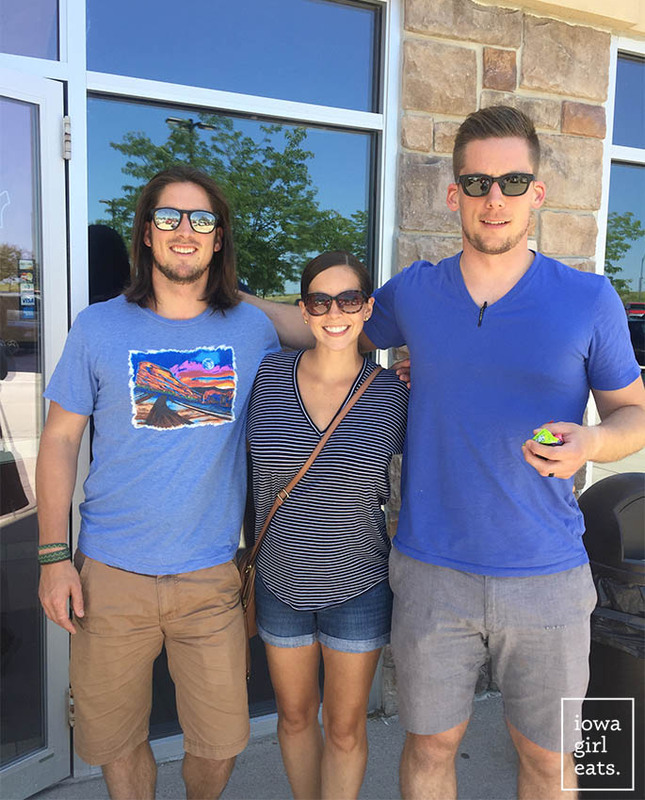 My younger brother (shifting to calling him “younger” instead of “little” because #heightdifferences – and I’m even on my tiptoes in this pic!) 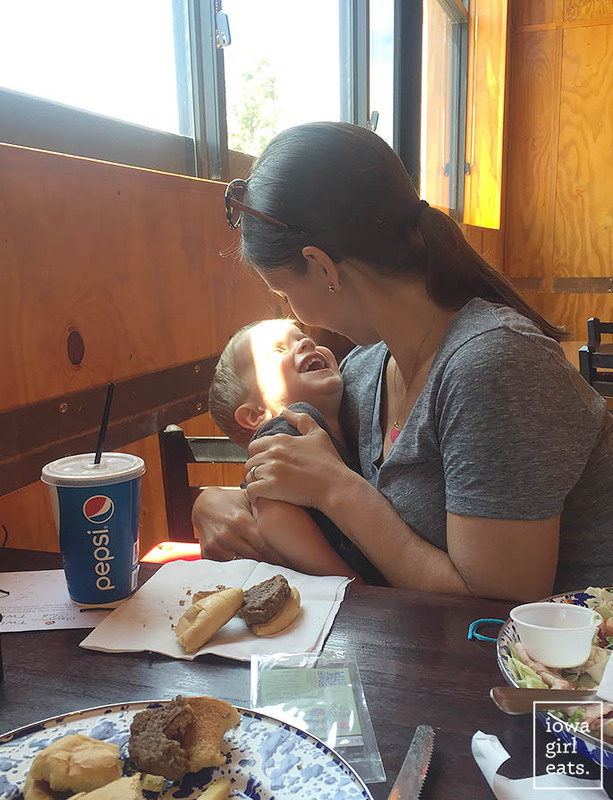 was in town from Denver for a friend’s wedding, so my parents, both brothers, Lincoln and I got together for lunch on Friday afternoon. Something felt odd as we sat down, then we realized it was the first time all five of us had been together sans significant others since my younger brother’s college graduation over 10 years ago. Maybe longer?? Insanity! 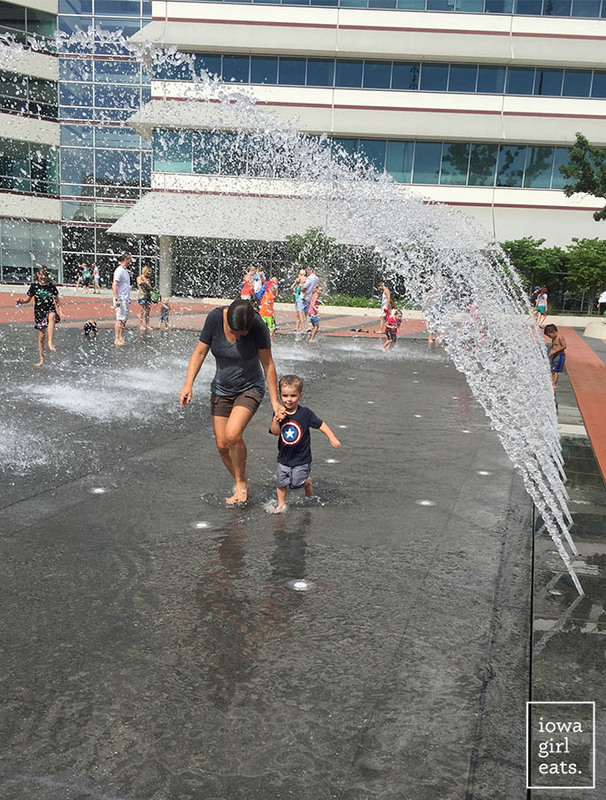 It was another scorching hot weekend so the next morning, when my Mom and I took Lincoln to the Farmer’s Market, we made a detour to some nearby fountains midway through. Even the adults were running under the tunnel trying to cool off. Of course the time Lincoln escorted me through the the jets, the wind picked up and I got soaked. Typical! 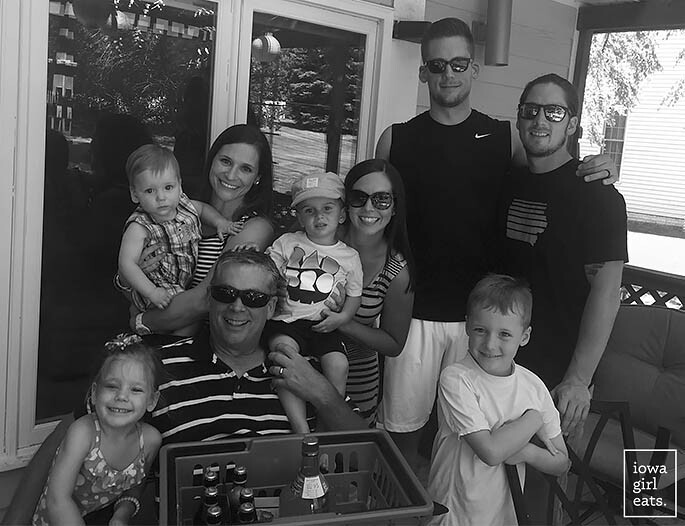 Sunday was Father’s Day so we all gathered at my brother and sister-in-law’s house to celebrate not only Ben, my brother, and Dad, but also my nephew’s first birthday. Can’t believe how fast an entire year has flown by, though we can’t remember life without him. Sam is the sweetest, most content baby you’ll ever meet! You will be too (content, not a baby,) after trying a heaping scoop of Crock Pot Baked Beans at your next cookout! 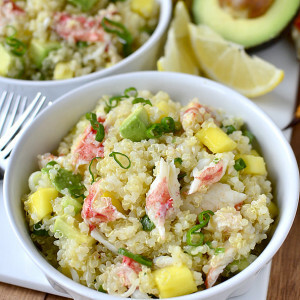 Oh yes, one of my favorite summertime staples just got a slow cooker makeover, and not a moment too soon. There is no way I’m turning the oven on to bake my standard baked bean recipe for 2 hours in this weather – not when I can contain the heat in a crock pot and let it do the cooking for me! I think it’s safe to say the countdown to July 4th is officially on, and with it also comes the countdown to one of my favorite meals of the year. 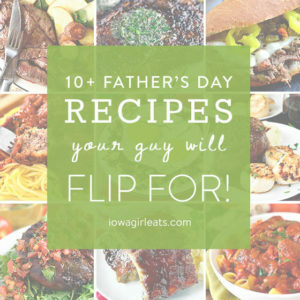 Brats, burgers, Brat Burgers, pasta salad, potato salad, fruit salad (ALL THE SALADS!) corn on the cob, Dirt Cake – can’t forget Beergaritas (next year!) – on one table, plus baked beans, of course. No summer event would be complete without baked beans and cooking them in the crock pot was a total revelation for me. First of all, like I said, no oven heating the house up. Second of all, totally easy to stir all the ingredients together ahead of time then plug the crock pot in and cook on the day of your cookout. Third of all, less bugs – keep the lid on the crock and voila! This baked bean recipe is basically the crock pot version of my Mom, Shirley’s, famous Baked Beans, aka Judy’s Baked Beans. Right. 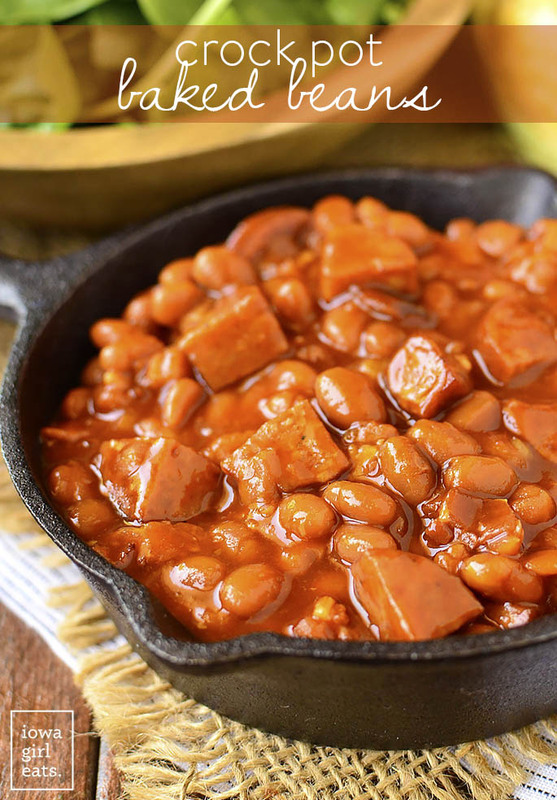 Anyway, they’re extra meaty, calling for both Polish Kielbasa (one of my love languages,) and bacon, though the beans are only lightly sweetened because while I do enjoy a sweeter baked bean recipe, I don’t like them candy-sweet. That’s what impulse purchases of Black Forest Sour Gummy Worms are for. ? Like I said, this recipe is great for a crowd because it feeds, well, a crowd (translation: it makes a ton of baked beans!) and but also because it’s portable. 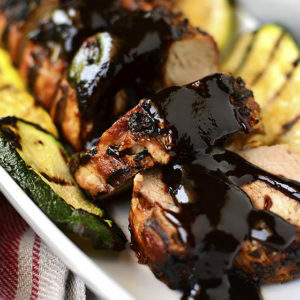 Slow cook then take to a friend’s house for a 4th of July BBQ, or transfer straight from your kitchen to the food table at your own get together. No matter what, you’ll love the rich and sassy, perfectly sweet and tangy taste of these delicious and summery baked beans! 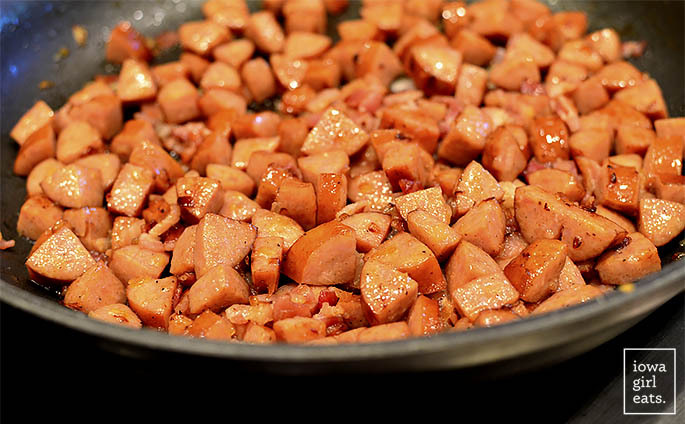 Start by adding 14oz gluten-free Polish Kielbasa (I like Johnsonville brand which is GF,) and 4 slices bacon that have been chopped to a large skillet with 1 large shallot or 1 small onion that’s been chopped. Turn the heat to medium then saute until the bacon is cooked through but not super crisp, 10-12 minutes. Pour everything (bacon fat and all – hello, flavor!) 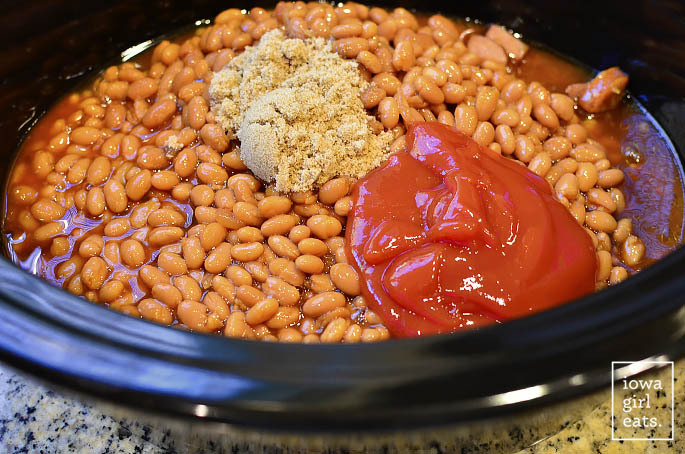 into the bottom of a 6-quart crock pot then add two 28oz cans baked beans (I’ll show you my fave below,) 1/4 cup ketchup, 2 Tablespoons brown sugar (or more if you like your baked beans super sweet,) and 1 Tablespoon worcestershire sauce then stir everything to combine. As I mentioned, you can do this a day ahead of time so all you have to do is place the crock into the base and turn it on the day you’re going to eat. Great time saver! 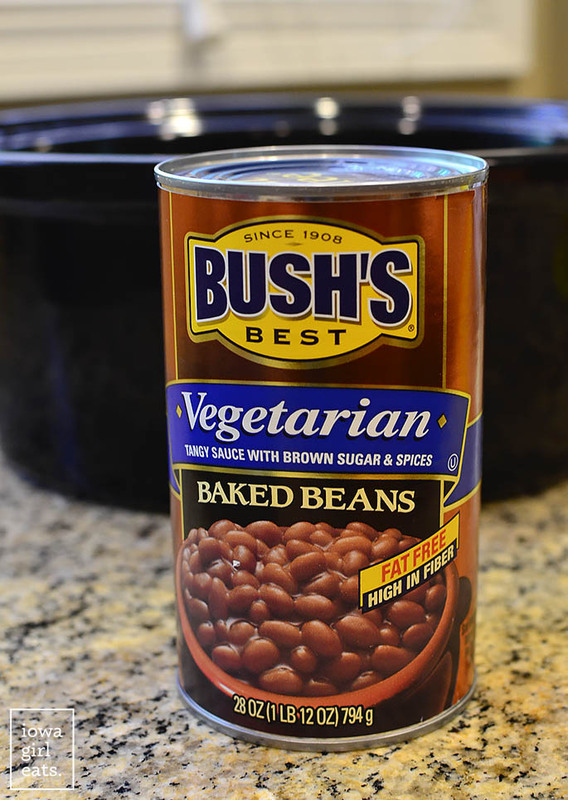 I’ve liked Bush’s Best Vegetarian Baked Beans for years and years. Obviously I’m not vegetarian, but this particular brand/variety is gluten-free and not tooth-achingly sweet. That said, you can use whatever you like. Place a lid on top of the crock pot then cook on low for six hours. Remove the lid to let the liquid thicken up for 10 minutes or so then scoop and serve with all your cookout favorites. 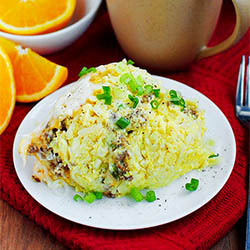 Hope you enjoy this easy summer side dish! 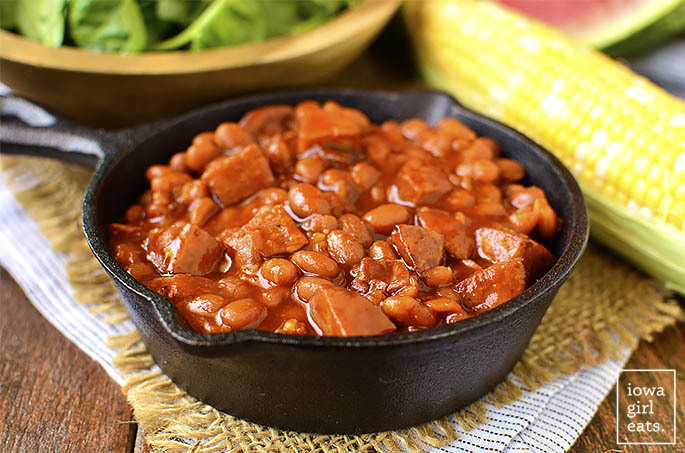 Crock Pot Baked Beans is a rich, sassy, and super simple crock pot recipe that's sure to become a summertime side dish staple at your house! Add kielbasa, bacon, and shallot (or onion) to an unheated, large skillet then place over medium heat. Saute until bacon is cooked through but not too crispy, 10-12 minutes, then transfer mixture to a 6 quart crock pot. Add remaining ingredients then stir to combine. Cook on low for 6 hours then remove crock pot lid to allow liquid to thicken up for 10 minutes, and then serve. Thank you so much!!!! Having 50 -75 people over for a party on the 2nd. I wanted to make Judy’s Baked Beans but really didn’t want to have to commit to all of that oven time. This is the perfect solution! You’re the best! Totally!! 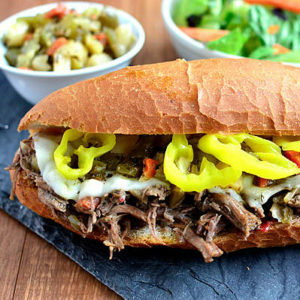 Get two or three crock pots going and you should be set! Sounds like a great weekend! 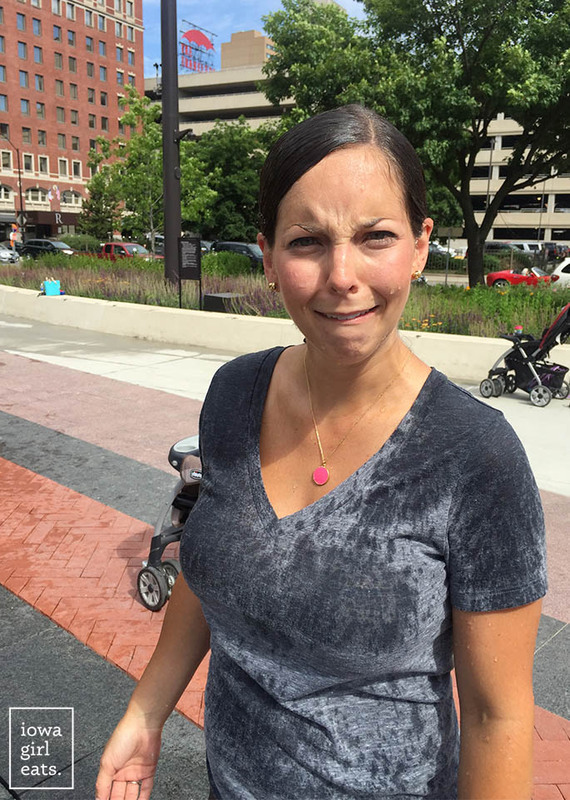 That would’ve been me, getting soaked… Haha! My weekend was pretty productive too: got some cleaning done and on Sunday we went out for Brunch. Love this recipe btw! We eat baked beans so often, so this one we’d definitely love too. Yeah! I need a deep cleaning session too. Sounds like a great weekend – have an even better week, Vivian! Do you think you could freeze the extras? This looks amazing but it’s only 2 of us so I would love to freeze in smaller portions for later! Definitely! This recipe would also be extremely easy to halve then cook for 2-3 hours. 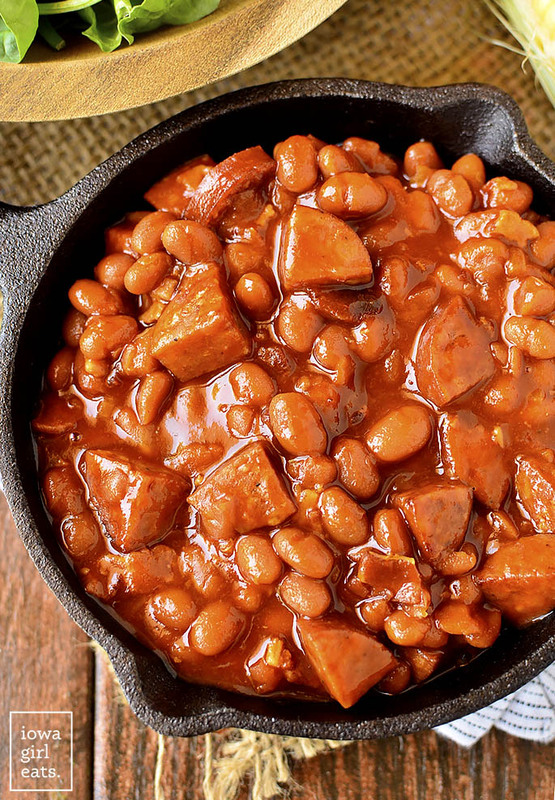 Kielbasa is a great ingredient for baked beans! Nice!! I’ve been making your recipe for Judy’s Baked Beans for a couple of years now. I noticed this version omits the crushed pineapple. Is that just to make them less sweet? I LOVE this recipe. I’ve never added Worcestershire Sauce before, but the other thing I do differently is that I add Brown Sugar (Dark or Light) and Light Maple Syrup. I am going to use this one as my base….. I’m all about the base ha! I put the same ingredients in my baked beans, even the same Bush’s! My secret ingredient? Black strap molasses! 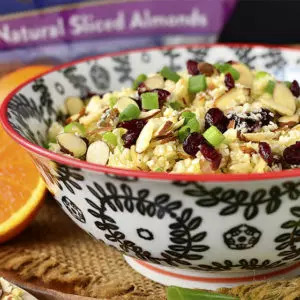 Thank you very much for sharing this recipe! I compared the original to this slow cooker version and decided to give this one a go. A definite hit with my family! I used an Oscar Meyer Select uncured beef sausage instead of kielbasa because I had it on hand. And I really liked the vegetarian Bush’s for the base — will be using those again for sure. Delicious all around! So glad to hear it, Valerie! Thanks so much for the feedback! 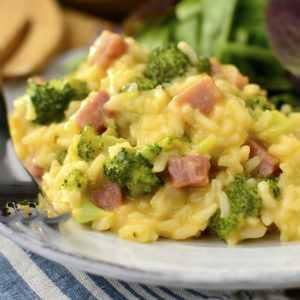 Love this great side dish recipe! I am with you, I didn’t like baked beans much when I was a kid but now it is a whole different story. These look delicious and I love that you can make them early in the day and let them cook in the crock pot. Pinning! do you think a double batch would fit in a 6 quart crock pot ? It would be full, but I think it could fit!